I’m thankful for my immediate family and my ability to love & care for them and for the love and care I receive from them. I’m thankful to have known love, and to have loved abundantly and passionately and without regret. I’m thankful for my family that are a direct result of, and a testiment to, that love. My sweet, sweet, innocent grandbabies G1, G2, G3, G4, G5 and G6, who bring snuggles, squeezes, kisses and cuddles and oh so much fun, excitement and pure joy into our lives! My three sisters, who are my dear friends and my examples of beautiful women inside & out & their faithful spouses, my bros-in-law who are good men and who love & support them and are also my friends. My brother Bobby, though I never met him has always had a special place in my heart & mind. My many nieces, nephews, and grandnieces & grandnephews who have filled my life with love, joy and pride, from the very first one who was born when I was just seven to those that today are just babies and toddlers! My new teaching job, my nice home and many possessions, comfort and warmth, security, transportation, and my pets. 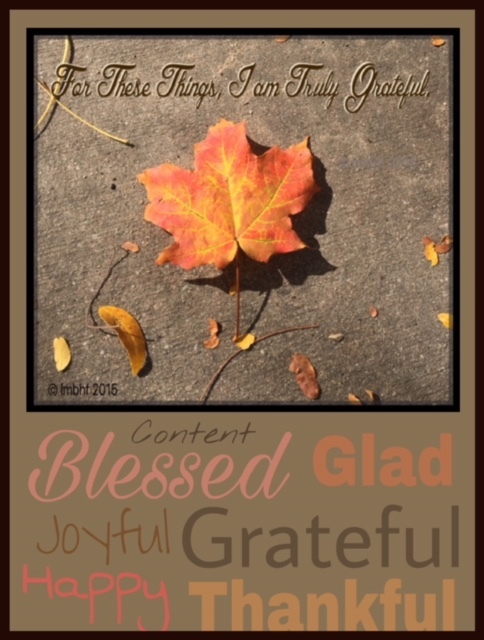 I’m thankful for the undeniably purposeful and intelligent design of our world and the spiritual awareness that allows me to be thankful and truly grateful for all of these things and oh so, so many more! !